Written by Angie Sammons. Published on October 28th 2014. SOMEBODY on Twitter last week described it as the most hotly anticipated restaurant opening in Liverpool this year. Yet food-loving barrister Nisha Katona didn’t even invite the cast of Hollyoaks in to give their holy blessing last Friday night when she flicked the lights on under the stove on Bold Street’s newest baby, Mowgli. Weep you PR and party people. No red carpet or flashguns. Only one clue: a hastily Windolened sheet glass door, left just off the latch, bearing a “private party” notice. The builders had finally moved out and tonight the family and friends (admittedly Mike McCartney and Andy McCluskey among them) were in to give their verdict on this Richard Eastwood-designed temple to Indian street food. Nisha Katona is no relation to the Warrington celebrity queen of the jungle, Iceland ads and Atomic Kitten. She is, however, Liverpool’s nearest thing to a spice girl and her star is on the rise. Mowgli claims to be the first restaurant of its kind in the North West, possibly in the UK, with USPs oozing out of every pore. It could well propel Mrs Katona to a much bigger stage, doing for Indian cuisine what Nigella Lawson once did for licking a cake spoon. But that doesn’t mean she’s taking it easy. On Sunday, just half an hour before Mowgli finally let the curious paying public in, the self-proclaimed curry evangelist confessed she was terrified, albeit expressed in rather more profane terminology. “The food could, the only thing I'm arsed about is the food,” she said. There has been a lot of online buzz about Mowgli. Nisha, mum-of-two, from Wirral, married to Hungarian classical guitar virtuoso Zoltan Katona, does talk the zealous talk and it has got her noticed. She regularly tweets an entire recipe, in just 140 characters, to her 20,000 followers on Twitter. She has her own YouTube channel of instructional videos and she stages classes in “curry confidence” all over Merseyside. Hers is a Curry-in-a-Hurry mantra, (soon to be the title of her first book from Jamie Oliver’s publishers) which says any such dish can be made in 20 minutes with just a base of three spices. Of her decision to dive into the real world of National Insurance returns and trips to the cash and carry, she explains: “I could just be some gobby woman who tweets and takes pictures of curry, made at home. It was time to take the leap and put my money where my mouth is." So what of the food? Why, dear reader, go to Mowgli when you could go to, say, the Back Passage to India, just down the street? Because like the owner’s vernacular, it is all quite refreshing. Adding a bit of Durbanista to the turbanista is the South African head chef, Gavin Barker, who has gegged one or two home takes onto the menu, such as Bunny Chow, a rich lamb curry served inside a bread loaf, staple of railway workers back in his own old country. 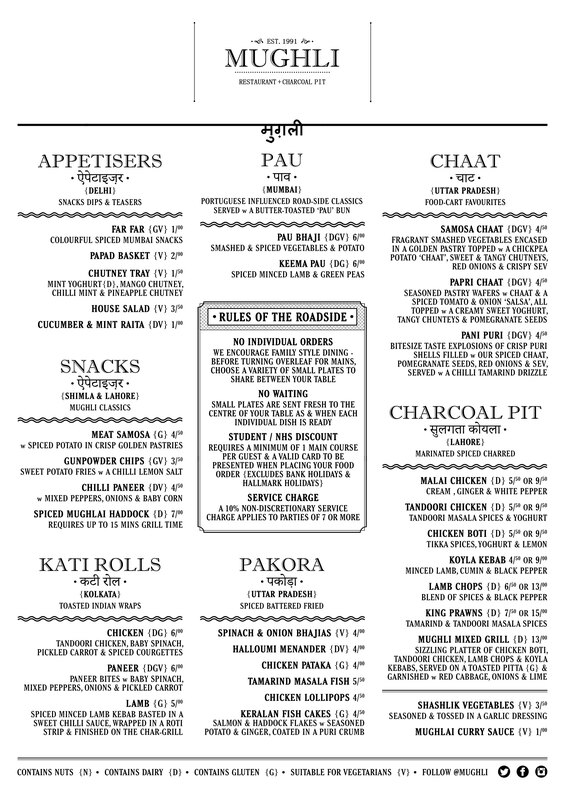 The menu is divided into sections: “Street Meats”, such as Angry Bird, a whole tikka spiced chicken for sharing. “Mowgli Meals”: all your chicken, lamb and seafood curries. Adding a dash of gallows humour is one called Keema Therapy, but the £6.50 price does include a donation to the Clatterbridge Cancer Charity. In large parts of India, vegetarianism is the way of things, so much so that restaurants there list a minority of carnivorous dishes as “suitable for meat eaters.” Thus, in the Hindu Kitchen section lurk Calcutta Cabbage Tangle, Poppyseed Potatoes and Fenugreek-kissed Fries. There are also (very good) puris, rootis and rices and a whole section of authentic desserts. Practically everything is way, way under a tenner. There is more, and Mowgli declares its pot luck tiffin boxes unique. Here we have food roulette, one has no idea what one is going to get and no two boxes are the same. In places like Bombay, tiffin boxes are a whole industry, as ubiquitous as Tupperware containers here. Every day, a nation’s army of workers marches on them, delivered from their own homes by another army of wallahs. And then they take the empties back again. At Mowgli, on Saturday night by now, the novelty was borne out by plenty of substance that sent the table groaning. Springing forth from a meat-filled “Office Worker” box (£12) and an “Indian School” meat-free offering (£10) were two well-thought out lamb and chicken house curries, tea-steeped chickpeas, Picnic potato curry, a good, thick comforting Temple Dahl, plenty of basmati rice steamed with black cardamoms and cumin, and Krishna only knows what else. Like surprises? Try a Yoghurt Chat Bomb - especially for those of you who don't mind something exploding in your mouth without warning. Scores on the doors another time. And there will be another time. Popped in for lunch today, had the Keema Therapy savoury mince with rootis, and 'Proper Ginger Tea' served, surprisingly, with milk. All very excellent and quite unlike what you might expect 'Indian' food to be like, but they don't have crimson flock wallpaper either. Waiting staff need to be a lot more clued up - people next to me arrived first, but I got served before them. It is usual for your food to be placed in front of you not plonked down on the other side of the table making you reach across for it and effectively wait on yourself, but hey ho, these are early days. Very well worth the visit.